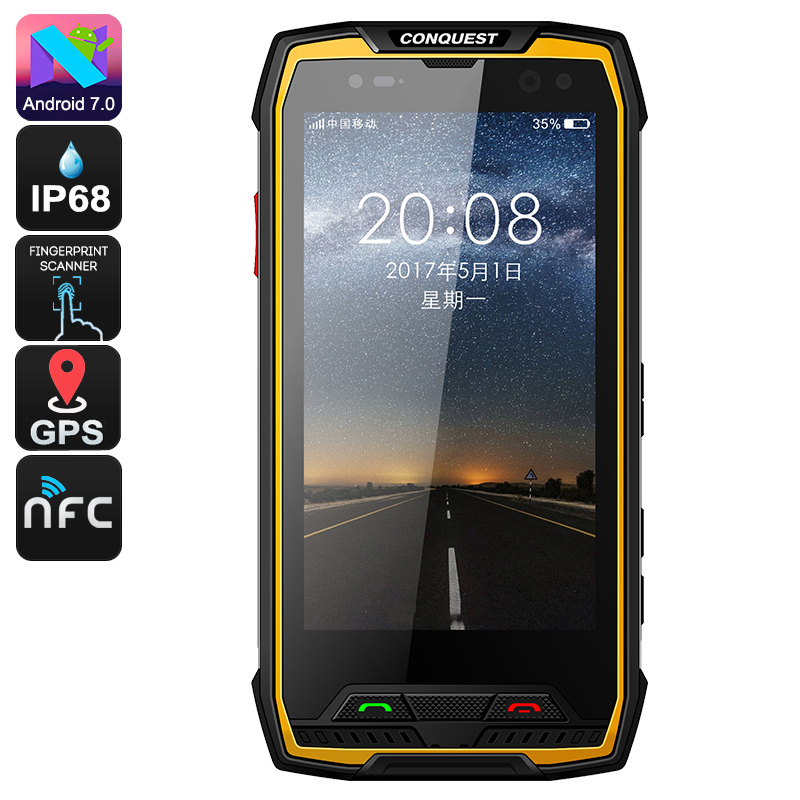 Successfully Added Conquest S11 Rugged Phone - IP68, Android 7.0, Octa Core CPU, 6GB RAM, 5 Inch HD Screen, NFC, OTG, GPS, Fingerprint (Yellow) to your Shopping Cart. When it comes to a good mobile, the biggest deal breaker is short battery usage time. However, the battery standby of up to 700 hours or 16 hours of operations is enough for even the avid mobile users. Conquest S11 comes with a first-rate 16.MP rear and 13MP front camera. Now, you can capture your all your much-loved moments wherever you go. The display resolution of 1920x1080 provides a good video quality so that you watch movies in high resolution. In addition to that, it is compatible with 3GP, MP4 and AVI video formats.With that said, it also supports most photo formats. Some of them are GIF, PNG, BMP, and JPG. Now, your everyday instagraming is sorted out for good. This smartphone is compatible MP3, WMA, WAV audio file formats.It has a 3.5 mm audio jack that provides excellent sound quality.With a high-frequency FM, Bluetooth support and Fingerprint option, this phone seems to be more than you can handle. The overall design of this phone makes it quite a compelling choice for many people. The Conquest S11 rugged phone comes with 12 months warranty, brought to you by the leader in electronic devices as well as wholesale waterproof phones and cool gadgets..